Table 3-2-1-1 shows the number of Boryokudan members, etc. (refers to regular members and quasi-members of Boryokudan; hereinafter the same in this and the next section) over the last 10 years. In 2009 the number of regular members decreased by approximately 11% from that in 2000 while that of quasi-members increased by approximately 5%. 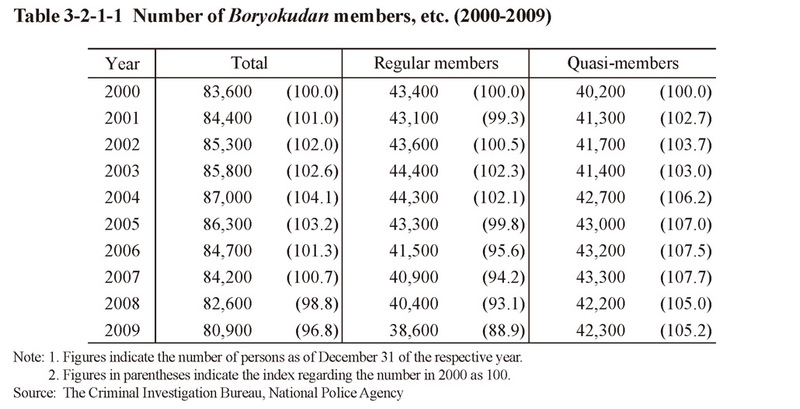 As of the end of 2009, 22 groups were designated as designated Boryokudan under the Act for Prevention of Wrongness by Boryokudan Members (Act No. 77 of 1991; hereinafter referred to as the “Anti-Boryokudan Act”) and regular members of the three major groups, namely, the Sixth Generation Yamaguchi-Gumi, the Inagawa-Kai and the Sumiyoshi-Kai, were approximately 29,800 persons (down approximately 1,300 persons from the end of the previous year), thus accounting for approximately 77% of all regular Boryokudan members (Source: The Criminal Investigation Bureau, National Police Agency). 2,119 termination orders (down 151 from the previous year) and 65 recurrence preventive orders (down 21 (id.)) were issued under the Anti-Boryokudan Act in 2009 (Source: The Criminal Investigation Bureau, National Police Agency).